In deciduous to tropical-deciduous forests and residential places with such vegetation I have found this insect to make continuous sounds all through the day (even in nights sometimes) during the summers. Average summer temperature > 30 C around noon and ~ 28-29 around nights with high humidity. I want to know what is the reason they make this sound ? Recently, I found several of them dead near light poles etc..., and some sit very close to windows of air-conditioned rooms. I think they want some cool environment. These are Cicadas, of the superfamily Cicadoidea of the order Hemiptera. These sounds are made by the males to attract mates. There are a lot of species, each making there own specific sound to attract the right mate. However, to the human ear, these sounds don't sound different. Cicadas are also able to produce other sounds, in distress or during courtship and mating, but the continuous sound during night and day is to attract mates. These are definitely cicadas and mating is the primary reason for their long calls. 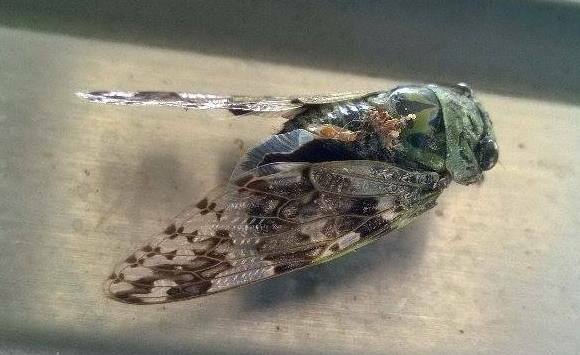 As for the reason you've found many dead or dying cicadas, their lifecycle is primarily spent underground where they feed on tree roots. They will emerge and transform into their adult form which enables them to make their calls and mate, and many species die shortly after mating, having fulfilled their evolutionary function of reproduction. Some species spend up to 10+ years underground before emerging to mate for only a short week or so. Not the answer you're looking for? Browse other questions tagged zoology entomology or ask your own question. Are mosquitoes repelled by high frequency sound? What's this insect (Oregon, USA)?